In 1929, O'Keeffe went to Taos at the invitation of friends Dorothy Brett and Mabel Dodge Luhan. 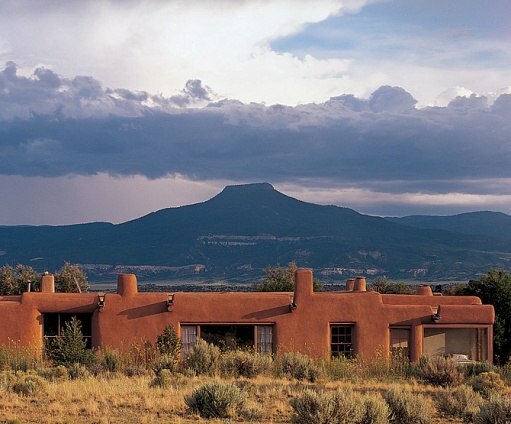 There she heard of Ghost Ranch and once even caught a tantalizing glimpse of it from a high plain. In 1934, she finally found the ranch but was dismayed to learn that it was a dude ranch owned by Arthur Pack and Carol Stanley. However, a place was available for her that night in Ghost House and she spent the entire summer at the ranch. But Rancho de los Burros was a summer place and also a desert one. O'Keeffe wanted a garden and a winter home. 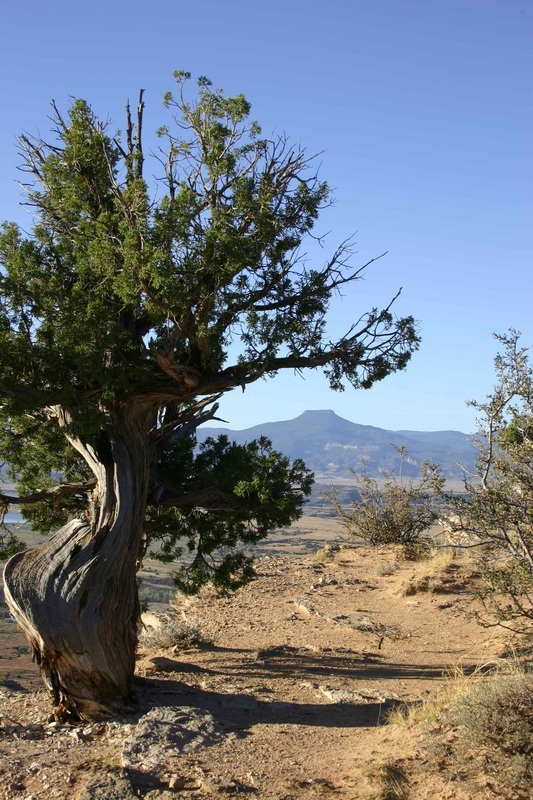 Eventually, she bought three acres in the village of Abiquiu. 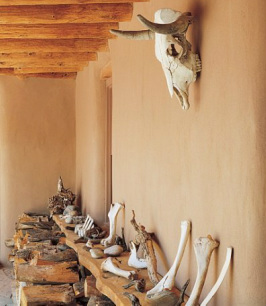 She spent three years remodeling and rebuilding the crumbling adobes before the place was fit for human habitation. After her husband, Alfred Stieglitz, died, O'Keeffe left New York to make Abiquiu her permanent home. In 1955, Arthur and Phoebe Pack gave Ghost Ranch to the Presbyterian Church. O'Keeffe was aghast. The Packs should have sold her the ranch, she thought, and besides, she never cared much for Presbyterians anyway. Her precious privacy would be gone. However, from the very beginning of this new relationship the Presbyterians respected and tried to preserve the privacy of their famous neighbor. Visitors were told, as they are today, that Rancho de los Burros was on private land with no public access. Gradually her fears were allayed and the relationship grew warmer. Office personnel sometimes did secretarial work for her; Ghost Ranch folks replaced the pump on her well. O'Keeffe became friendly enough with long-time ranch director Jim Hall and his wife Ruth to have Christmas dinner with them. She made a money gift toward construction of the Hall's retirement home on the ranch. When fire destroyed the headquarters building in 1983, O'Keeffe immediately made a gift of $50,000 and lent her name to a Challenge Fund for the Phoenix campaign which resulted in replacing the headquarters building and adding a Social Center and the Ruth Hall Museum of Paleontology. 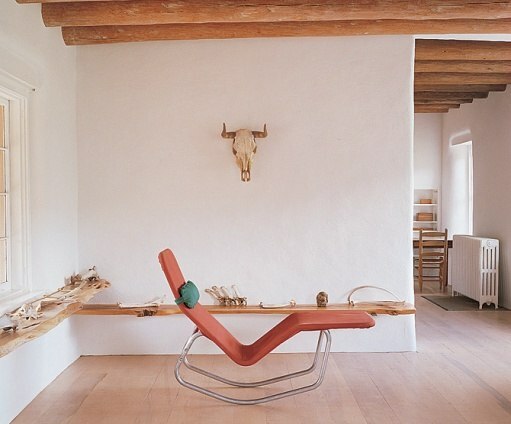 During the last few years of her life O'Keeffe was unable to come to Ghost Ranch from Abiquiu. Eventually she moved to Santa Fe where she died in her 99th year, reclusive to the end. "I find people very difficult," she once said. “To me it is the best place in the world. It has always been secluded. which had a ghost living in it."